I saw the light in Marks & Spencer. A beauteous bag of coconut mushrooms spoke to me, and what they said was good. And what they said was, ‘Lady, you will make a coconut cake, and anoint the top of this coconut cake with us, the sweets of heaven’. So yeah, I bought the bag of coconut mushrooms, ate half of them and saved the rest to put on top of my cake. I used this recipe, but I didn’t bother with the lime syrup and I substituted an 8 inch round cake tin for the ring tin. Once the cake was cool, I slit it in half using a bread knife and spread raspberry jam on the base. I made a simple water icing by mixing icing sugar and water ( I didn’t bother measuring out the icing sugar, but I should have used more to make a thicker icing). 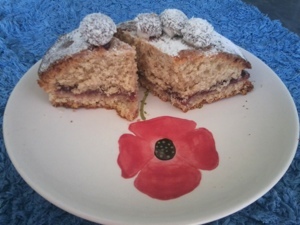 As my icing was much thinner than I wanted, after securing the coconut mushrooms to the top with a bit of jam, I sifted icing sugar over the top.